Tottenham Hotspur manager Mauricio Pochettino may be the bookmakers favourite to get the number one job at Manchester United on a permanent basis but on Thursday the club press officer refused to allow questions on the matter. The press officer said the 46-year-old Argentinian -- whose attractive style of football and ability to bring on young players has earned him praise -- had dealt with the matter on Tuesday. On that occasion -- just hours after Jose Mourinho had been sacked -- he said there were a lot of rumours and he could not answer such a question but "wanted to deliver my best at this football club." However, Britain's Press Association reported that at Thursday's press conference -- to look ahead to Sunday's match with Everton -- the press officer eventually resorted to asking for the cameras to be turned off after the journalist posing the question refused to cede ground. A debate lasting just under two minutes then took place over the matter. One question mark that has been posed about Pochettino's eligibility for the United job is he is yet to win a trophy. 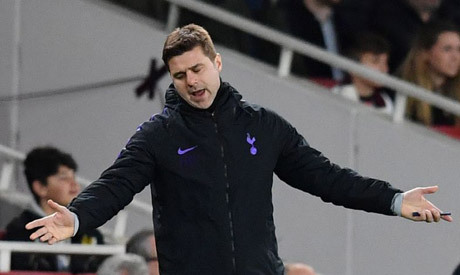 Indeed under Pochettino Spurs -- who have not won a trophy since the 2008 League Cup -- have fallen short in two successive FA Cup semi-finals and surrendered a lead over Juventus in the last 16 of the Champions League last term. They will try and dispose of the 'chokers' tag in a two-legged League Cup semi-final with Chelsea -- who beat Spurs in the 2015 final of that competition in Pochettino's first season in charge -- in January. However, Pochettino -- who is contracted to Spurs till 2023 -- played down the possibility that the elusive trophy was within their grasp. "Closer? I think it's a long way still," he said. "I think we're playing against Chelsea over two legs and of course it's going to be our fourth or fifth semi-final in four-and-a-half years.